Troitskaya Square, Saint Petersburg, Metro station: "Gorkovskaya". The foundation of the first city wooden Holy Trinity Church was laid on 29 May (16 May in the old style) 1703 at command of Emperor Peter the Great and consecrated on 10 July 1711. The project was designed by the architect Domenico Trezzini. During the first years of St. Petersburg existence, its center was Troitskaya Square, and the temple had a status of cathedral and was named as the Petrovsky Holy Trinity Church. 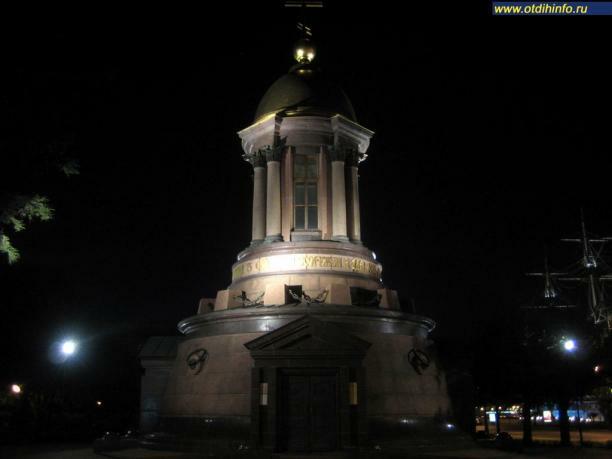 It was there where Peter I was inaugurated as Emperor of Russia. In 1750, the wooden temple was burned down, and in 1756, a stone church was built instead of it. Later, it was reconstructed and finally destroyed by the Bolsheviks in 1933. The modern Church Chapel is built on Troitskaya Square, in a public garden at the intersection of Kamennoostrovsky Avenue and Petrovskaya Embankment, near the Peter and Paul Fortress by the Troitsky Bridge. The project was designed by the architecture bureau YK (the architects: Alexander Kitsula, Alexey Mikhalichev, Gleb Ribakov) and built by the Baltic Construction Company. The design won an open championship for the best project of a Church chapel in memory of the first Orthodox temple in St. Petersburg. The Church Chapel was consecrated on 28 May 2003, the 300th anniversary of St. Petersburg. The Metropolitan of St. Petersburg and Ladoga Vladimir did the office of consecration to diocesan clergy.